According to a recent report, users share a wide range of information about themselves on social media sites. Indeed the sites themselves are designed to encourage the sharing of the information. I do not know a single person who does not use social media for exchanging information and messages. Studies show that the typical (median) Facebook user has 300 friends, while the typical Twitter user has 79 followers. Around 60% of Facebook users keep their profiles private, and most report high levels of confidence in their ability to manage their settings. Users are sharing more information about themselves on social media sites than they did earlier. For the five different types of personal information that we measured in both 2006 and 2012, each is significantly more likely to be shared by social media users on the profile he or she uses most often. Where do you think all this data is going? Oh yes, you guessed it right; over Facebook servers! Do you think your information is safe there? I do not think so. With the current rise in cyber attacks, your data is not safe on some third party servers even if their security measures are very tight. It is true that the data protection is of utmost importance for most of the users of personal electronic devices. You do not know where your messages are stored. You have no idea if they are being used to gather useful info about you. This is worrisome considering a large number of users use these social media platforms for exchanging messages and data transfer. As we discussed modern Messengers, do encrypt their data using strong algorithms, but sometimes their source code can be vulnerable and may intentionally give out your information to the third parties. Most of the Messengers do access your private data directly and may store or pass this info on to their servers. This most of the times are not noticed by the average user as this is being concealed under providing “ease of use” to them. Adding on to the point above, mostly all the Messengers require access to the user’s email and phone number to identify them. Their account is also linked to the other social media platforms on which they have an account. This can be/is used to track user’s browsing behavior, habits, and favorite sites and so on. Not only this, corporation can receive access to user’s private folder, messages, relationships, and preferences. Scary, huh? Most of the times, the user does not have an option but to accept the so-called “terms and conditions” of the corporation to download or use the app. They are forced to accept the T&C (terms and conditions) to continue using the Messenger app. By agreeing to the T&C and giving their coerced consent to get their data collected by the company user has no other go. This data can also be sold to interested third parties at the will of the corporation. A user’s IP address disclosure is another pretty secondary yet important problem in most of the legacy Messenger apps. Last but not the least, these corporations govern their user accounts and are free to restrict users and sometimes even block the user’s account without giving any proper explanation to the user. Telegram, e.g., blocks its user accounts, as a response to third party’s complaints. 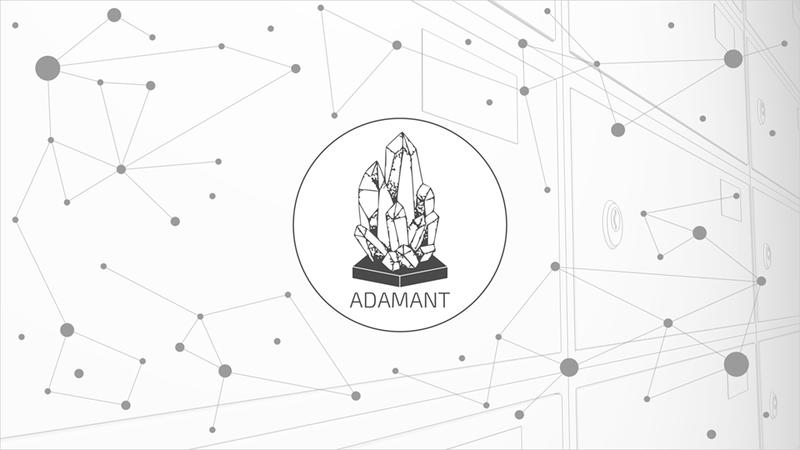 ADAMANT is a secure platform for data and message transfers based on the Blockchain along with an inbuilt payment system. It takes data privacy very seriously and is based on the robust concept of Blockchain. The Blockchain is all about anonymity and does not let anyone trace the message history of a user. You do not have to provide any emails, phone nos., and address to use the Blockchain system. With an open and public source code, it lets anyone interested in auditing the code independently and even building a fully functional system on their own. • All messages are fully encrypted on the sender’s device and then decrypted on the recipient side. No one including the developers) has access to your information. • ADAMANT accounts cannot be closed, blocked or limited by anyone, including the developers. • It is a full independent token and is built as a self-sufficient system. 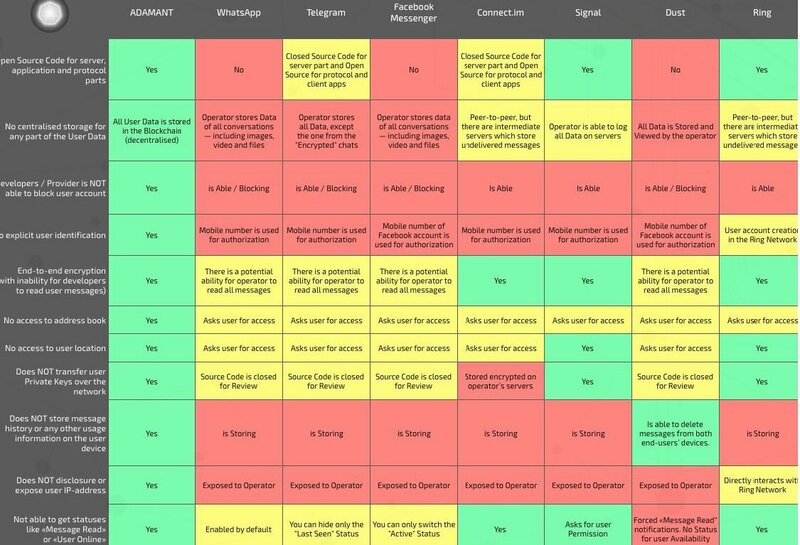 The chart below gives an overview of the other alternative/third-party legacy solutions and the how ADAMANT is different from them. • DPoS system is easily scalable and highly reliable. Full Node: It contains the entire Blockchain database and which can participate in new blocks forging. Light-clients: that runs full data encryption on their side before further transferring to the Blockchain. Ethereum is an open source software platform based on Blockchain technology that enables developers to build and deploy DApps (Decentralized Apps). Unfortunately, it is not suitable for maintaining the ADAMANT network due to high transaction fees aka “gas” involved for every transaction on Ethereum Network. ADAMANT is however built on independent Blockchain which allows lower transaction/operating costs over the network. Not only this, the costs can be adjusted according to the rising token price in the future. ADAMANT ecosystem provides flexibility to make changes to transaction fees if required. Currently ADAMANT is available as a Web App on all major browsers on mobile and desktops. This will be extended to native iOS and Android platforms very soon. The message transfer to Blockchain fees is calculated approximately as the exact message size cannot be determined due to the messages being encrypted. Hence the transfer fee is a rough estimate – 0.001 ADM for every 255 UTF-8 symbols received. Anyone can create an account and use the ADAMANT Messenger. Free ADM tokens will be available to anyone who creates a new ADAMANT account to get them acquainted with the Messenger.